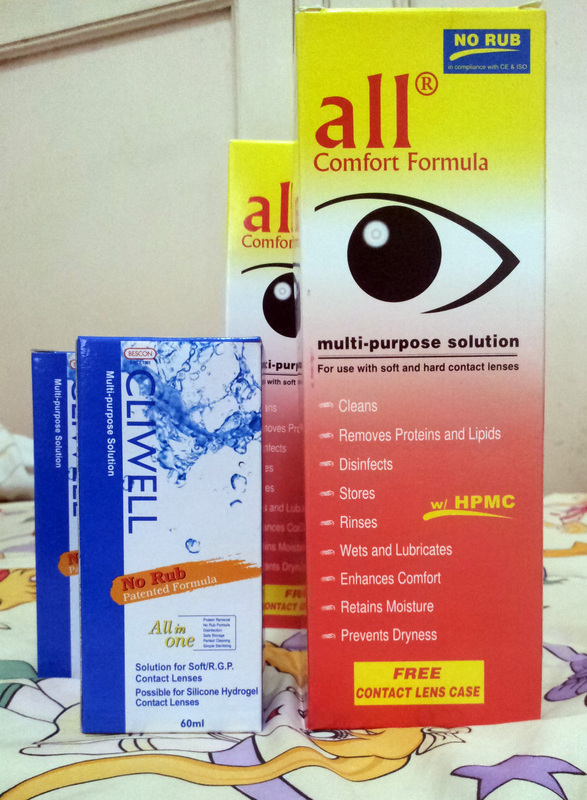 As a person with myopia (nearsightedness) who never feels comfortable with eyeglasses, I resort to contact lenses. I’m really glad contact lenses were invented. Without contact lenses, I would always have headaches from eyeglasses even if the lenses’ grades are updated. Last Saturday, my mother and I went to Paterno St., Quiapo. Goals were to get me a new pair of contact lenses, buy huge bottles of multipurpose contact lens solution with free contact lens case, and buy travel size multipurpose solutions for an upcoming flight with colleagues to Rootcon 8 in Cebu. If you know that you should look for a colorful interior with greens and yellows, you won’t miss this optical shop. This was where I bought my 2013 to 2014 pair of contacts. Their contact lens price and quality were not bad, the shop is not far from my house, waiting time is short, and the staffs are accomodating and are all Pinays… so I had no reason not to come back, right? xD Chinatown/Binondo is another not-so-far place from my house and there are optical shops there, but I’d rather go to Quiapo because the Chinese doctors in Binondo area make me feel uneasy. Think language barrier. Clear contact lens for extended wear (approximately 1 year of use) cost 1200 pesos. The brand they sell is New Look. The doctor first checked my eye grades with that apparatus where the patient leans forward and see a hot air balloon photo. xD I think it’s called an autorefractor. Then she proceeded with the other eye exam where she made me wear that heavy eyeglasses where she added and took away lenses from. Through these two test, the doctor would determine the best power that your contact lenses (even eyeglasses) need. The waiting time for the contact lens was only 30 minutes. Mom and I went to buy stuff from Isetann first to kill time. Vista Prima Optical is open until 6PM anyway. We ate at Phat Panda Fast Food at Bustos St. The “small” size servings of dishes were good for two people and cost only 100 pesos. We ordered mixed seafood with vegetables which was nice because it had oysters, fishes and squids. I like those. The other dish was sizzling beef. It’s like Chinese-style beef with buttery sauce and vegetables. It was so-so to me. We also ordered fried rice, and it was bad. The rice was so soggy and it was almost like eating paste. Service was bad. There were only three staffs walking around to serve – two ladies and one guard. And when I said service was bad, it’s about one of the waitresses. I asked her for service water when she took our order. I waited. But when every food was already served to us, the water was still not brought to us. So I asked the same waitress again for water, and she said “Sige wait lang po.” And so we waited again. But she never served us water. She just kept serving other tables and seemed to have no intention of getting back to us. Another table asked for hot tea, and she, the same waitress who wouldn’t bring us water, immediately served them hot tea. We asked the other waitress for water, and she gave us a pitcher right away. Geez! Was the waitress doing it on purpose? She shouldn’t, because there’s no reason for her to do so, since we were politely requesting stuff from her. After the irritating lunch at Phat Panda, we went back to Vista Prima Optical to claim my contact lenses. 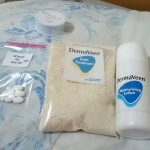 The New Look contact lenses came with a 60 ml bottle of Bescon Cliwell multipurpose solution and a free contact lens case. That small bottle gave me hope of finding a similar bottle that I could bring to a flight. They don’t have huge bottles of contact lens multipurpose solutions there that had free contact lens case, so I told my mom I’d check out other optical shops. 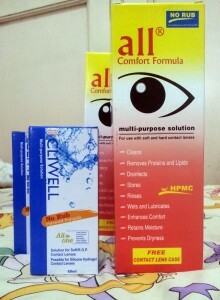 I saw bottles of “All Comfort Formula” multi-purpose contact lens solution being displayed at “I Sight Optical Centre” so I walked in to buy some. We realized that it’s the same optical shop where my mom purchased eyeglasses last year. Each 500 ml bottle costs 220 pesos with free contact lens case. 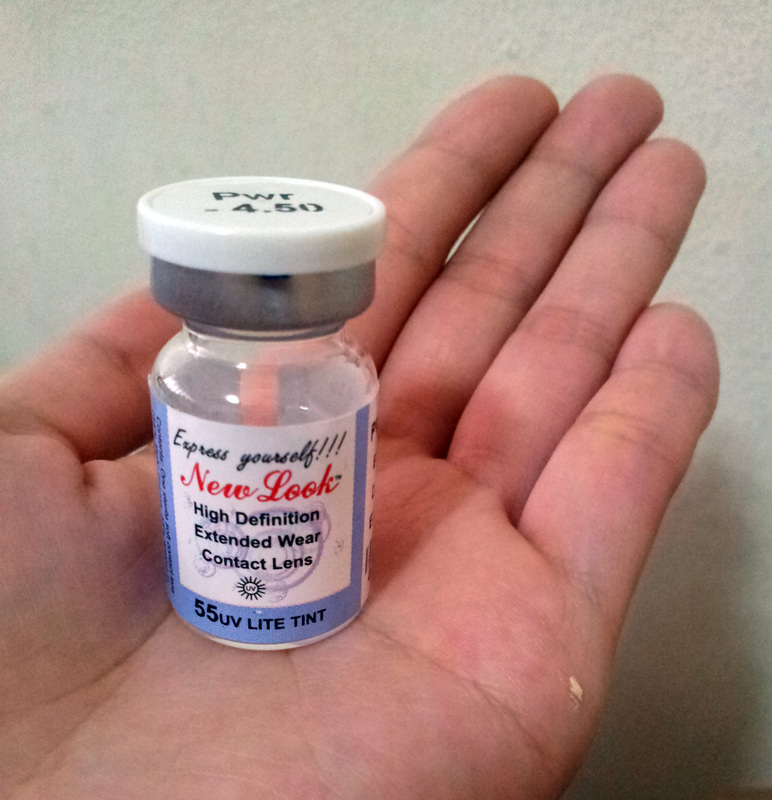 It’s a bit more expensive per ml compared to my usual multipurpose solution called Lens Care (95 pesos for about 350 ml bottle), but Lens Care has a supply problem lately. The reason why I wanted to look for multipurpose contact lens solution in Quiapo is because of Lens Care’s supply problem in Mercury Drug stores. Lens Care could be found in any Mercury Drug branch, until recently. I went to a branch in Sta. Cruz, in EDSA, in Binondo, and in Makati, and there was either the expensive Opti-Free brand or nothing. In the next few weeks, I’ll be on a flight bound for Cebu with office mates. We will be attending Rootcon 8. 🙂 We are not checking in any luggage, and that gives me a problem with my contact lens solution. 3.4 oz or 100 ml is the maximum volume of liquid per container for carried bags in planes, while my solutions are 350 ml and above. My original plan was to drop by a Mercury Drug store upon landing, and buy contact lens solution there. But I felt that there would also be a supply problem of Lens Care in Cebu. 2 years ago, I was able to buy Lens Care in Cebu, but that was a time when supply was not a problem. So I thought, I would either buy that expensive Opti-Free solution (300+ pesos, IIRC) in Cebu or wear glasses for 4 days while walking around in unfamiliar places. It will be a very tough stay in Cebu if I only wear glasses. There would be constant head and eye pain, and difficulty in moving around. My mom didn’t want to check another optical shop. Getting tired, I think. But I told her I really need to find a small bottle of multipurpose solution similar to that freebie from Vista Prima. Another optical shop with an array of contact lens solution being displayed caught our attention. It was called “New SOS Optical Supply Co.” And they had the very same 60 ml bottle of Bescon Cliwell! 😀 Each bottle costs 65 pesos… or was it 60? xD Each bottle comes with free contact lens case too.